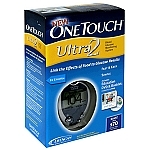 A Glucose Meter is the integral part of a complete blood glucose monitoring system. Blood is applied to a test strip and the glucose meter is able to detect the amount of blood glucose present in your blood. We keep a wide range of glucometers and glucometer brands in stock so that you can quickly and easily purchase the blood sugar monitor that best suits your needs.